To watch this event, please click here. The hegemony of finance compels a new orientation for everyone and everything: companies care more about the moods of their shareholders than about longstanding commercial success; governments subordinate citizen welfare to appeasing creditors; and individuals are concerned less with immediate income from labor than with appreciation of their capital goods, skills, connections, and reputations. In this book (from MIT Press), in clear and compelling prose, Michel Feher explains the extraordinary shift in conduct and orientation generated by financialization. That firms, states, and people depend more on their ratings than on the product of their activities also changes how capitalism is resisted. For activists, the focus of grievances shifts from the extraction of profit to the conditions under which financial institutions allocate credit. While the exploitation of employees by their employers has hardly been curbed, the power of investors to select investees—to decide who and what is deemed creditworthy—has become a new site of social struggle. 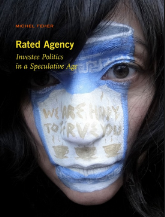 Above all, Feher articulates the new political resistances and aspirations that investees draw from their rated agency. Michel Feher’s new book (read the review) from MIT press describes the extraordinary shift in conduct and orientation—among companies, governments, and individuals—generated by financialization. Feher, a Belgian philosopher, is the author of Powerless by Design: The Age of the International Community and the editor of Nongovernmental Politics and Europe at a Crossroads, among other titles. Founder of Cette France-là, a monitoring group on French immigration policy, Feher is also a founding editor of Zone Books. Event co-sponsored by the Columbia Maison Française, Columbia Center for Contemporary Critical Thought, and European Institute. Visit our Centennial Website—an online exhibition about the 100-year history of the Maison Française and special ties between Columbia and France. Archival photographs, documents, letters, videos and more! Stay Informed Receive periodic e-mails about upcoming events. We promise not to overdo it!